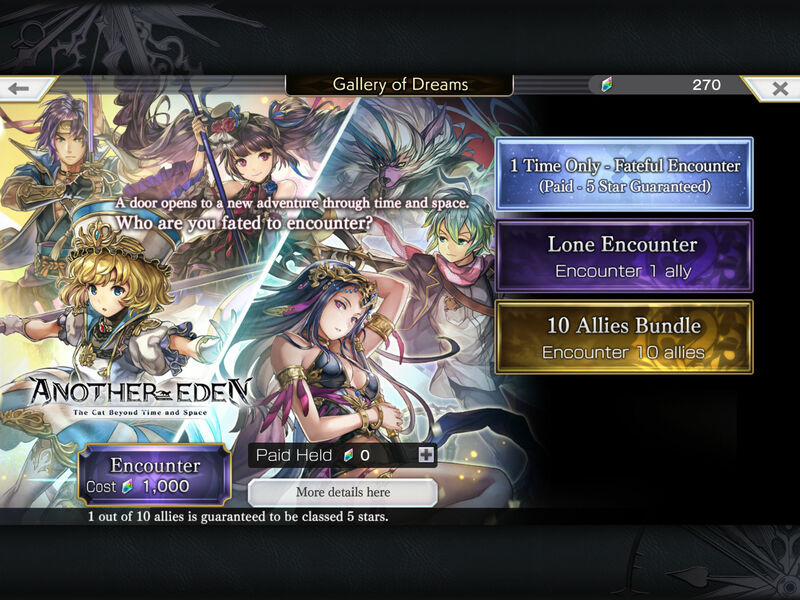 In a world of cookie cutter mobile RPGs, Another Eden (Free) stands out for its expansive story and commitment to letting you play for long sessions without asking you for money. And yes, it’s technically ANOTHER EDEN, all caps, but I don’t think it’s polite to yell in my guides. The story of Another Eden is really a big selling point. Even though it relies on a pretty well-worn trope of time travel and collecting companions from different times/worlds/what have you, it throws a few wrinkles into the former and doesn’t beat you over the head with the latter. In fact, even though it uses a gacha-type system for adding characters to your roster, the game doesn’t even emphasize that all that much and simply lets you get lost in its narrative — with one kind of diabolical exception that we’ll get to after you click through like 15 slides. Just kidding about that last part. Let’s start at the beginning, as it were, and guide you through Another Eden with all of the tips, hints and other goodies I’ve gathered so far. Your POV character in Another Eden is a young swordsman named Aldo. Recently promoted to his village guard unit, he has a somewhat mysterious backstory where he and his sister were abandoned as young children and found by the mayor. As tends to happen in RPGs, he ends up inadvertently becoming entangled in a much, much larger battle between good and evil that spans centuries, all because he follows his cat into a strange portal. To move Aldo around, as well as other members of your party once you have some, simply hold down on the screen and slide your finger left or right. You can also swipe up or down when there are pathways to do so or buildings to enter. The mini-map in the upper-right corner will quickly become your best friend, not only showing you the layout of each region but also pointing out quest-givers and people to whom you need to speak. Just tap on the speech bubble above an NPC’s head to talk to one of them. In classic old school RPG style, you’ll run into encounters with enemies at random while traveling around anywhere but inside towns. 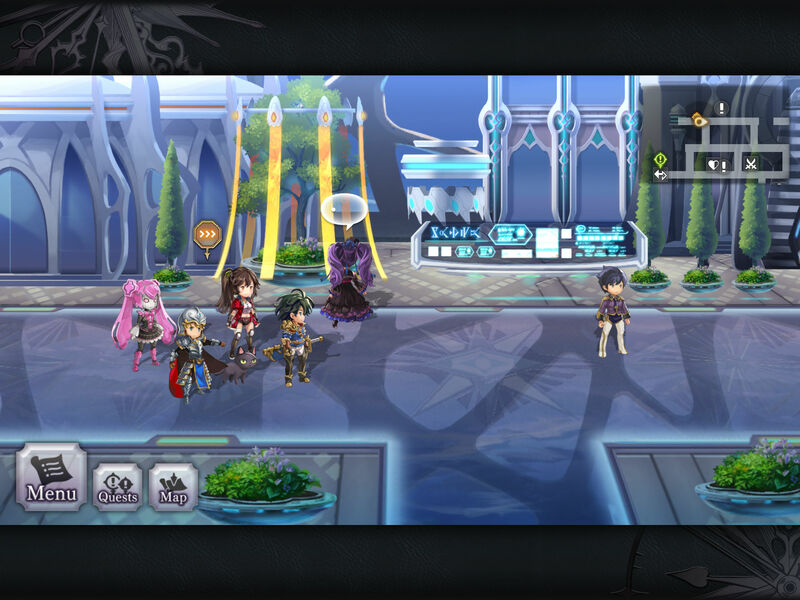 Another Eden uses a turn-based combat system, but one that requires you to plan an action for each member of your team before each turn begins. This definitely takes some getting used to, but it will start to feel natural after a while. 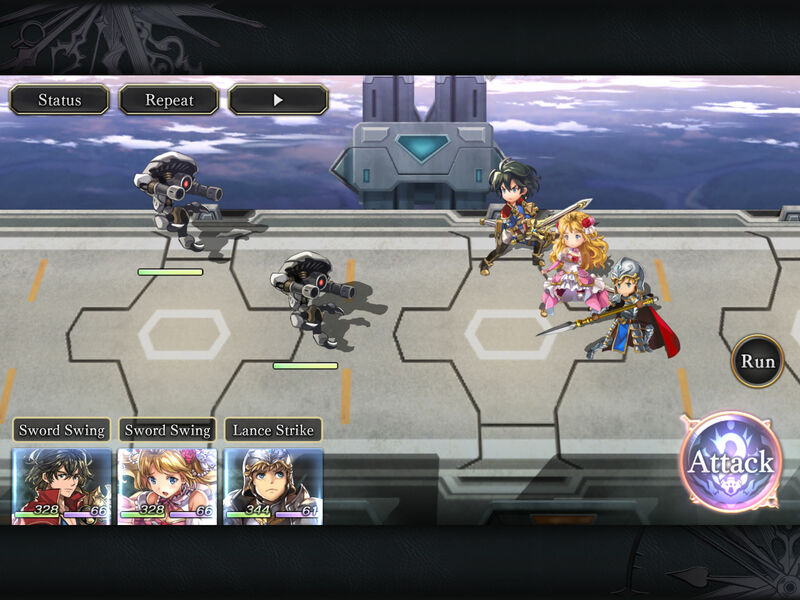 What you’re seeing is a pic of each character on your team, as well as the attack or ability they will use this turn if you do nothing — and that will always default to each character’s basic attack if you leave it alone. To change actions, simply tap on the name of one and it will bring up all the options for that character. From there, you can hold on any of them to learn more about their effects/cost (there are Magic Points to consider), or just tap to select. Once you’ve locked in the actions you want each character to take, you just tap the ‘Attack’ button in the lower-right corner and a full round of combat will play out, for both you and your enemies. Bonus tip: It is possible to change which enemy your characters are targeting to attack by tapping on one, but you can’t pick targets for each character. Everyone will concentrate on the one you pick for that round and then move onto another if it is defeated mid-turn. While you can’t control when you get into fights, you do have a valid option if you blunder into a battle too tough for your current level/gear: Run. There’s a handy ‘Run’ button on the right side of the screen in every battle, and from what I can tell, it works darn near all the time. Just vamoose if things seem like they will be too tough. That’s especially true for Horrors, really tough Boss-type monsters that are roaming around most levels. Since they are marked on the mini-map, you should be able to avoid them most of the time, though occasionally you will have no choice but to take a route that leads by one of them. Horrors will chase you but the only way you have to fight them is if they actually catch you, and again, you can run from combat if needed. Horrors tend to vastly outlevel the regions in which you find them, so you only want to tangle with them if you are confident you can win. Even though Another Eden gloriously breaks free from many F2P RPG conventions, one way that is not is probably going to be the sore spot for many players: You acquire new characters in gacha fashion, and you have to pay for the privilege of the best chance at the rarest characters. Let me back up a half-step to explain. New characters appear as dreams to our heroes, and then, as I understand it, become real. Forgive me as I’m still working through the story myself. In any case, you summon new heroes by tapping on the ‘Dreams’ button from the main nav bar. Once there, you’ll see what the game calls Encounters, which are simply summons by its own fancy name. 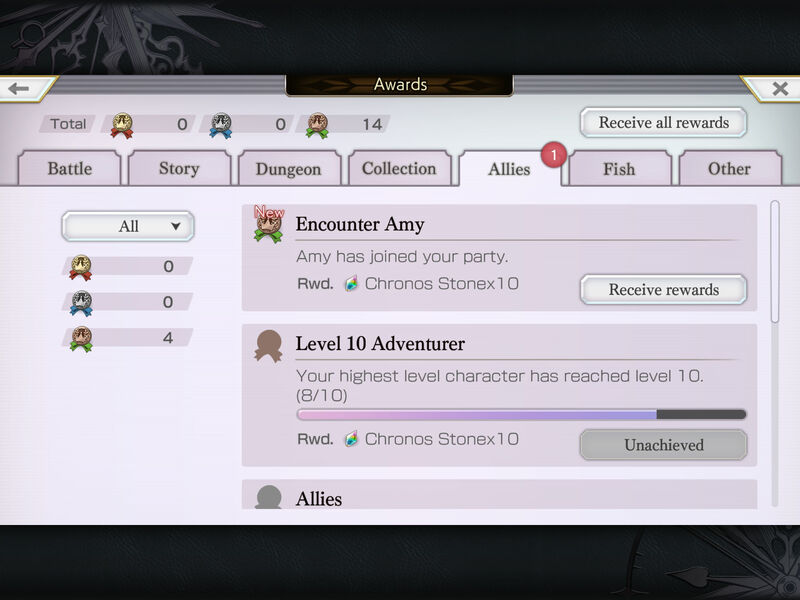 To activate an Encounter, you’ll need to pay 100 Chronos Stones, which are the game’s premium currency. There’s also a bundle so you can summon 10 allies at once, though no discount for doing so. Now here’s the kind of crappy part: There is a one-time only Fateful Encounter that guarantees you a 5-star ally, the rarest and potentially most powerful in the game. But you can only do it if you’ve paid for Chronos Stones, as the offer can’t be purchased with currency you rack up for free. Yes, it stinks, especially since 1000 Chronos Stones will set you back somewhere north of $20, even with special deals taken into account. Is that worth it for a single 5-star guaranteed? I haven’t played enough yet to know for sure, but it feels mighty steep to me. In fairness to Another Eden, this is one of the most non-money-grubbing RPGs on mobile out right now in every other way. Heck, just the absence of an energy system earns it that honor. But I’d be remiss if I did not point out this particular facet of the summon process. But maybe the above section doesn’t bother me, and like Dirty Harry once famously said, you feel lucky. You still want to pile up as many Chronos Stones as you can, because you can at least nab some 4-star characters and maybe even 50 stars, you just won’t have any guarantees. Fight lots of enemies – Every time you defeat a new type of enemy for the first time, you’ll get a few Chronos Stones as a reward. Tackle side quests – This is a game where the main quest line alone can easily keep you occupied for hours, but you’ll eventually be able to take on a number of side quests as well. It’s not a bad idea to do that, because the spoils can be quite good, and they include Chronos Stones. Keep plowing through the story – Though rushing through the tale this game is telling seems like kind of a shame, I’m also well aware that lengthy dialogue scenes aren’t everyone’s cup of tea. That said, making steady progress through the story also pays off, in the form of free Chronos Stones at the end of every chapter. Knock out ongoing goals in the ‘Awards’ tab – Similar to may other RPGs, Another Eden has a wide range of achievements you can find by tapping on the ‘Awards’ button. There are seven tabs in the menu you’ll find, including some we’ve already discussed and others based on dungeons, collecting weapons, and even fishing. Lots of options, which is always a good thing. Just keep playing – There are rewards just for logging in, just not as obviously as in many other mobile titles. Be sure to check your inbox daily and you might be pleased by what you find. Of all the systems in Another Eden, this is actually one of the more perplexing ones. Where you’d expect weapons to be either purchased or crafted, its actually sort of a hybrid mix here. As you adventure, you’ll find materials out in the world by finding places that sparkle and tapping on them. You’ll earn more as loot by defeating monsters. Instead of using those materials yourself (one guesses you just aren’t that handy with an anvil, maybe), you take them to the Blacksmith in any town and sell them. Not only do those transactions, perhaps obviously, give you more money with which to buy weapons and armor, but turning in more and varied materials also expands the selection from which you can choose. Then you just buy what you need. 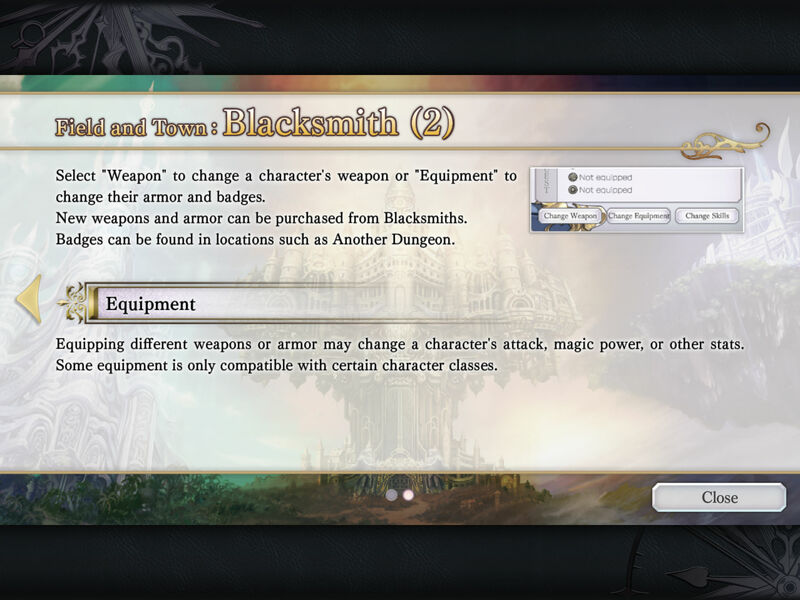 Selecting any item at the Blacksmith and tapping the ‘Try On’ button will show you how it affects any character’s stats. Allies who can’t use that particular item — this means weapons, usually, or gear that requires a level too high for them at the moment — will be grayed out.